This institution was often referred to as the "city on the hill" or as a "city within a city." At the height of its existence, the school housed 500 children in 16 cottages. Other buildings would include a nursery, hospital, school, gymnasium, laundry, and residences for employees and the superintendent. 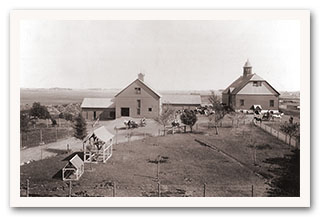 The school had its own power plant, greenhouse, icehouse, cemetery, and complete farm with cows, horses, swine, and chickens, making it close to being self-sufficient. The Main Building served as the school nerve center. Built in five phases beginning in 1886 at a cost of $50,000, it came to house the library, chapel, offices, employee and children's dining rooms, industrial departments, and living quarters for small boys and employees. Trades: Many crafts were conducted right on campus. In a normal day you could visit a functional bakery, cobbler shop, laundry, barber shop, sewing rooms, butcher, and carpenter shop. Agriculture: Originally housed on 160 acres, the grounds grew to 329 acres by 1937 with 42 acres for campus and 287 acres for cultivation to feed all the livestock, and fruit/vegetables for its inhabitants. In addition to grains, the State School farm produced potatoes, carrots, beans, squash, strawberries, raspberries, apples, etc. The Wards were expected to act as the primary labor force, especially during harvest. Many foods were canned and stored for use in winter.